^ McDowell, Jonathan. Jonathan's Space Report, No. 267. 哈佛-史密松恩天文物理中心. 1995-12-08 [2007-05-06]. （原始内容存档于2011-08-10）. ^ 28.0 28.1 Rogers (1995), p. 81. ^ Rogers (1995), pp. 85, 91–4. ^ 31.0 31.1 31.2 31.3 Rogers (1995), pp. 101–105. ^ Rogers (1995), pp. 125–130. ^ Rogers (1995), pp. 133, 145–147. ^ Rogers (1995), p. 133. ^ Beebe (1997), p. 24. ^ Rogers (1995), pp. 219–221, 223, 228–229. ^ Rogers (1995), p. 235. ^ Pearl, 1990, pp. 12, 26. ^ 65.0 65.1 65.2 Beebe (1997), pp. 38–41. ^ Smith et al. (1979), p. 954. ^ Rogers (1995), p. 191. ^ Rogers (1995), pp. 194–196. ^ Beebe (1997), p. 35. ^ Rogers (1995), p. 195. ^ Rogers, John. Interim reports on STB (Oval BA passing GRS), STropB, GRS (internal rotation measured), EZ(S. Eq. Disturbance; dramatic darkening; NEB interactions), & NNTB. 英國天文協會. July 30, 2006 [2007-06-15]. ^ Rogers (1995), pp. 48, 193. ^ Rogers (1995), p. 193. ^ Phillips, Tony. The Great Dark Spot. Science at NASA. March 12, 2003 [2007-06-20]. ^ Rogers (1995), p. 223. ^ Phillips, Tony. Jupiter's New Red Spot. NASA. March 3, 2006 [2008-10-16]. ^ 85.0 85.1 Phillips, Tony. Huge Storms Converge. Science@NASA. June 5, 2006 [2007-01-08]. ^ Michaud, Peter. Gemini Captures Close Encounter of Jupiter's Red Spots. 雙子星天文台. July 20, 2006 [2007-06-15]. ^ 87.0 87.1 Diffusion Caused Jupiter's Red Spot Junior To Color Up. ScienceDaily. September 26, 2008 [2008-10-16]. 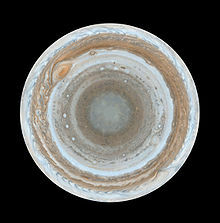 ^ Buckley, M. Storm Winds Blow in Jupiter’s Little Red Spot. 約翰·霍普京斯應用物理實驗室. May 20, 2008 [2008-10-16]. （原始内容存档于2012年3月26日）. ^ Steigerwald, Bill. Jupiter's Little Red Spot Growing Stronger. NASA戈達德太空飛行中心. October 10, 2006 [2008-10-16]. ^ Shiga, David. Third red spot erupts on Jupiter. New Scientist. May 22, 2008 [2008-05-23]. （原始内容存档于2008-07-05）. ^ 91.0 91.1 Rogers, John H. The collision of the Little Red Spot and Great Red Spot: Part 2. 英國天文協會. August 8, 2008 [2008-11-29]. ^ Rogers (1995), p. 6. ^ 101.0 101.1 Hockey, 1999, pp. 40–41. ^ Smith et al. (1979), pp. 951–972. ^ 103.0 103.1 Rogers (1995), pp. 224–5. ^ Rogers (1995), p. 226–227. ^ Rogers (1995), p. 226. ^ Rogers (1995), p. 225. ^ Beebe (1997), p. 43. Beatty, J. Kelly. Jupiter's Shrinking Red Spot. Sky and Telescope. 2002, 103 (4): 24 [2007-06-21]. Busse, F.H. A simple model of convection in the Jovian atmosphere. Icarus. 1976, 29: 255–260. doi:10.1016/0019-1035(76)90053-1. Encrenaz, Therese. ISO observations of the giant planets and Titan: what have we learnt?. Planet. Space Sci. 2003, 51: 89–103. doi:10.1016/S0032-0633(02)00145-9. Go, Christopher Y.; de Pater, I.; Wong M. et. al. Evolution Of The Oval Ba During 2004–2005. American Astronomical Society. 2006年9月, 38: 495 [2008-10-16]. Guillot, Tristan. A comparison of the interiors of Jupiter and Saturn. Planetary and Space Sciences. 1999, 47: 1183–1200. doi:10.1016/S0032-0633(99)00043-4. Hockey, Thomas. Galileo's Planet: Observing Jupiter Before Photography. Bristol, Philadelphia: Institute of Physics Publishing. 1999. ISBN 0750304480. OCLC 39733730. Irwin, Patric. Giant Planets of Our Solar System. Atmospheres, Composition, and Structure. Springer and Praxis Publishing. 2003. ISBN 9783540006817. McKim, R. J. P. B. Molesworth's discovery of the great South Tropical Disturbance on Jupiter, 1901. Journal of the British Astronomical Association. 1997, 107 (5): 239–245 [2008-10-16]. Reese, Elmer J.; Solberg, H. Gordon. Recent measures of the latitude and longitude of Jupiter's red spot. Icarus. 1966, 5 (1–6): 266–273. doi:10.1016/0019-1035(66)90036-4. Ridpath, Ian. Norton's Star Atlas and Reference Handbook 19th. Harlow: Addison Wesley Longman Ltd. 1998: 107. Rogers, John H. The Giant Planet Jupiter. Cambridge: Cambridge University Press. 1995. ISBN 0521410088. OCLC 219591510. Rogers, John H. Jupiter in 1999/2000. II: Infrared wavelengths (PDF). Journal of the British Astronomical Association. 2003, 113 (3): 136–140. Rogers, John H. The accelerating circulation of Jupiter’s Great Red Spot (PDF). Journal of the British Astronomical Association. 2008, 118 (1): 14–20. Sanchez-Lavega, A.; Orton, G. S.; Morales R.; et. al. The Merger of Two Giant Anticyclones in the Atmosphere of Jupiter. Icarus. 2001年2月, 149 (2): 491–495 [2008-10-16]. doi:10.1006/icar.2000.6548. Stone, Peter H. On Jupiter's Rate of Rotation (PDF). Journal of Atmospheric Sciences. 1974, 31: 1471–1472. doi:10.1175/1520-0469(1974)031<1471:OJROR>2.0.CO;2. Yang, Sarah. Researcher predicts global climate change on Jupiter as giant planet's spots disappear. UC Berkeley News. April 21, 2004 [2007-06-14]. Youssef, Ashraf; Marcus, Philip S. The dynamics of jovian white ovals from formation to merger. Icarus. 2003, 162 (1): 74–93 [2007-06-15]. doi:10.1016/S0019-1035(02)00060-X.